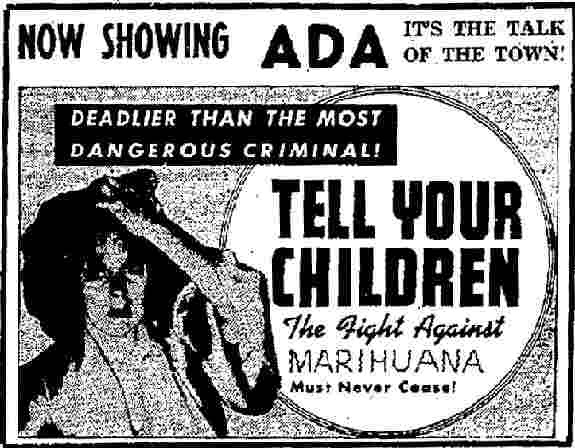 Newspaper Movie ad (Ada Ok. Oct 10, 1939), Courtesy of the Reefer Madness Era. To my shame the author must admit that like so many others before him, I too simply assumed that the kid had done it. My interests were simply limited to the usage of Medical Marihuana. Yes the kid did it, BUT MARIHUANA had NOTHING TO DO WITH IT. In fact (again to my shame) my mentality was that so long as Marihuana was innocent, who cared about anything else. Let Victor be guilty, the narc’s were lying to us about the effects of Medical Marihuana and that was that. Then something happened. I guess it can be called an epiphany moment. By shear happenstance I stumbled unto the below article -- It was at this point that I said to myself; “Hey wait a minute”, no one told me that there was a serial axe murderer out there. The slaughter of five members of the Michael Licata family at their Ybor city home early Tuesday brought to 19 the number of deaths charged to two Tampa axmen in the last seven years. Victor Licatga, 21, marijuana addict, killed five---his parents, two brothers and a sister. Benjamin Franklin Levins, 40, dope fiend, slaughtered nine. Five others were killed, and more than 40 were injured, in a mob’s unsuccessful attempt to take Levins out of the Hillsborough County jail to lynch him. Scattered here and there through west Florida’s criminal history there are frequent other cases of single deaths at the hands of axmen, but around these two---Levins and Licata---are woven the bloodiest and most horrible stories of crime ever entered in the State’s records. Both committed their crimes while under the influence of narcotics. Both stalked through dark, silent homes in the dead of night and crushed and smashed the lives out of innocent victims. Tampa’s first major ax murder, of recent years, occurred early in 1926 at a humble home in the Garrison, where neighbors found Beo Rowell, his mother, his niece and a friend, Charles Alexander, lying in their beds in a welter of blood, their skulls crushed. Investigation of the butchery failed to reveal the slayer, or a motive for the killings and it was still the biggest problem before local police when, a year later, the city was shocked again. This time there were five victims, a mother and father in financial circumstances no better than the Rowells. The two families were acquainted; other mysterious deaths had happened in their own circle of friends---the burning to death of a young girl and the slaughter of an older woman---but investigators were against a blank wall in their effort. They buried the Merrills---Lonnie and Nettie, the parents, ralph. 11. Buddy. 8 and Mildred, 5—and set out again in their search for a madman. Only a streak of fate saved the life of Hugh Merrill, 8, who had fallen out of bed and was lying on the floor when the axman entered his home. Little Lester Merrill, 6 weeks old, was struck over the head but he survived. A drive among dope fiends brought out Benjamin Franklin Levins, and officers subsequently obtained his confession that he slaughtered both families while under the influence of narcotics. Levins attempted a plea of insanity but he paid for his crime insanity, but he paid for his crime in the electric chair at raidord. While these nine deaths were charged against Levins the lives of five other men—S.J. Ellis, Hugh McRae, Hal Pifer, Earl McGill and W.E. Browning—were lost indirectly because of his acts. They were shot and killed, and two score others were injured, when a mob stormed the county Jail for three nights in an attempt to get Levins. Licata and his ax brought the total to 19 this week. BEFORE having located this article (in my mind), Victor was as guilty as sin. But now, much doubt, had been entered into my mind. To begin with, I noticed that the Rowell family had been one of the victim families. Could they have been related in any way to Earle Rowell, author of “On the Trial of Marihuana – The Weed of Madness”? And was it just happenstance that brought Earle Rowell himself to Tampa Florida just a few short months after the Licata incident? Next, I noted that the person arrested for the Rowell killings, (Benjamin Levins) [7A] was himself said to be a “dope fiend.” Which (in my mind) sounded very familiar; It was as if the two alleged perpetrators were interchangeable. This was more than enough for me to begin an active investigation into the matter. Could it be that Victor was innocent? AFTER all, WHY had no one, (certainly not Anslinger and the Bureau), brought out the fact that there was a serial axe murderer involved. A WARNING TO THE READER: It has been my experience that (in a lot of times), people believe what they want to believe and try to fit the fact around their beliefs. Thus, it can be said that – the author believes that Victor is innocent, therefore he will fit the facts based upon those beliefs. Possibly so, I will let the reader determine that. But (in my own defense) the reader should be aware that this will NOT be the first time that we have proven one of Harry Ansligner’s Gore File cases to have been a total lie. Probably the best example being that of the Eureka Axe Murderer – http://antiquecannabisbook.com/chap03/Eureka/EurekaAxeMurder.htm . For whatever reasons neither the narcotics police, nor any other Tampa officials wanted to volunteer the fact that the Licata family tragedy was NOT an isolated incident. That they were not the only victims of a serial axe murderer during that time period. Let us look at the 1926 incident, and remember that the Licata incident (1933) was only seven years away. Tampa, Fla., Aug. 19.---(Special)---Another chapter has been added to the long list of Tampa’s unsolved mysteries. Who killed the three Rowells and Charles H. Alexander? Tampa’s axe murders, the city’s most brutal crime, virtually has passed into the world of forgotten things. Three men, the remaining “suspects and material witnesses” in the case have been granted their freedom. Charles B. Parkhill, state’s attorney., made the announcement that insufficient evidence had been obtained to warrant their prosecution and ordered their release. Bill Johnson, “the Swede,” E.S. Keen and W. S. smith today are free for the first time for seven weeks. Four others persons, detained either as witnesses or suspects previously were ordered released by the investigation officers. Simultaneously with the announcement from the state’s attorney’s office came another from the city detective bureau that the investigation will continue. Joe Carter, chief of detectives, said that he personally with one member of his bureau would take up the case where the state has dropped it and seek a solution of the mystery which so far has protected the criminal who took four lives with an axe. Mrs. Carolina E. Rowell, 96: her son, Bee D. Rowell, 45, Mrs. Rowell’s granddaughter, Eva Lena Rowell, 15, and Charles H. Alexander, a roomer, in a little shack at 116 South Nebraska avenue, were found brutally chopped to death in their beds on the morning of June 28. Eva Lena Rowell was still alive but died a few minutes after she was found without regaining consciousness. C.L. Rogers and T M. Chevis, then members of the detective bureau, began the investigation and Bill Johnson was the first person taken in custody. He and Mrs. Cappie Carey, it was found, had been ejected a week before from the Rowell home. Cappie Carey’s husband, Elijah Carey, also was detained. Lee Weaver, who had accompanied Eva Lena Rowell to the home on the night before the murders, was held. And finally came the arrest of O. F. Fortner, E.S. Keen and W.S. Smith. These three were charged with having visited the Rowell home early on the morning of the murders and with having participated in a drinking bout with Bee Rowell. Fortner, however was soon cleared and was released. Carrey was given his freedom after the coroner’s inquest. Weaver was freed shortly afterwards. 116 S. Nebraska Ave, Tampa Fl. --- is about 1.5 miles away from the Licata family. That they were killed by an Axe murderer (just like the Licata family). While geographically possible, Victor Licata would have been too young at the time (1926) to have committed these murders. That previously (1926) there had been a long list of unsolved mysteries in Tampa. Not talked about in the above article was the fact that the head wounds caused by the axe were identical to those inflicted on the Licata Family members. In addition, (just as in the Licata incident some seven years later) the murder weapon (an axe) was found in the back yard of the Rowell house. Coincidence – Maybe but one must admit it does raise an eyebrow or two. MUSEUM NOTE: Some research has been done into the Earle Rowell connection. At the present time there is no evidence to indicate that there was any strong biological connection. But due to other circumstances, the possibility can not be ruled out. The next axe murderer attack in the Tampa area occurred a year later in 1927 (now only six years away from the Licata incident). In this case it was the Merrell family (Mr. and Mrs. as well as their three children) were all murdered in their sleep. The following (bits and pieces) from newspaper/historical documents indicate the severity of what had happened. TAMPA, June 9.—(AP)—Formal indictments of first degree murder on two charges each were returned late today by a grand jury against Benjamin Franklin Levins and Leonard Thompson in connection with the slaying here two weeks ago of five members of the Merrell family. Levins was specifically charged with the murder of two members of the family and Thompson was charged with killing two others. Levins was accused of having murdered Looney Merrell, the father, and in another indictment of having killed Nettie Merrell, the mother. Thompson was accused in two indictments of slaying two sons, Ralph and Walter. No indictment was returned for the fifth murder, the state contenting itself with bringing charges against the men on only the two counts each. News of the jury’s verdict will be delivered to the men in different parts of the state, the sheriff’s office having transferred them to an unnamed jail to escape the wrath of a mob which stormed the Tampa jail for three days. Announcement of the jury’s decision followed close after the court had appointed guardians for the four remaining members of the family. A local bank was chosen to watch over three oldest children and an aunt, Mrs. W.K. Neal, of Morehouse, Mo., was awarded the custody of seven weeks old Lester, who is still under hospital treatment. Tampa, Fla., July 27---(AP)---Calm and deliberate, Benjamin Franklin Levins took the witness stand in criminal court today and swore that threats of deputies to “turn him over to the mob,’ caused him to confess to the killing of Lonnie Merrell, his wife and three children last May. “I was scared to death,” Levins told the court while being questioned by C.E. Jones, his attorney. Jury sent Out While Levins was on the stand, the jury was sent out, his testimony being taken so that the judge could decide whether the confession was made voluntarily. The confessed ax-killer, self-possessed, answered questions of his own counsel clearly without hesitation and parried those of the prosecuting attorney. Under cross-examination Levins said he was not sure whether or not he told the grand jury that the confession was made voluntarily. It was also brought out that the defendant was beaten up while in the county jail. Didn’t Know Them “Who beat you up?’ the state’s attorney asked. “Several men. I do not know who they were, but I think one was named Kirkland,” he replied. Levins identified the signature of the confession as his own. The court reporter, R.F. Johnson, who took down Levins’ confession before the grand jury, was called to the witness stand when court opened this morning, to testify to circumstances surrounding the confession. He read transcripts from Levins’ testimony before the jury in which Levins said his confession made while in jail in Orlando was made secretly and without compulsion. Always doubted whether he was actually the killer in the first place. They even visited him on the day before the execution and tried right on up to the end to get a stay of execution for him. But main emphasis was placed on the mob scene that had occurred outside of the jail. Where the Florida National Guard had to be called up to try and stop a lynching. The irony of it all was that Levins was executed in the electric chair at Raiford Prison, the same place where Victor Licata would be found dead some years later. However at least the prosecutors were not able to convict a second victim that they had selected. Tampa. Sept. 6--(AP) -- Leonard Thompson, who went on trial for his life today as the alleged partner of Ben F. Levins in the murder of five members of the Merrill family here last May, walked out of the court room a free man late today when his trial abruptly terminated. Case Collapses. Thompson was charged specifically with the murder of Wallace Merrill, 3, and Ralph Merrill, 11. The entire structure of the state’s case against him collapsed with stunning suddenness when Levins, who as a state’s witness, was expected to relate how he and Thompson killed the sleeping Merrills with a spike maul, denied any connection with the crime and swore he knew nothing of it. Levins is under sentence of death for having killed Lonnie Merrill, the farther. Levins’ testimony came less than two hours after the jury had been sworn in. He was the third witness called to the stand and state’s attorneys made no effort to conceal the fact that it was by his testimony that they expected to convict Thompson. Circuit Judge Robles ordered the case nolle prossed after repeated efforts of C.B. Parkhill, state’s attorney, to extract from Levins something like a reiteration of the statements made during his own trial had failed. “I have been praying for two days for strength to come up here and tell the truth and now I am going to do it.” Levins declared. “I went to bed the night those people were killed out there: I didn’t go near the house and everything I said before was because I was afraid for my life. The gist of the latter statement was repeated over and over and finally the state’s attorney gave up the task. Thompson and Levins were arrested less than 48 hours after Mr. and Mrs. Lonnie Merrill and three children had been found in their beds with their skulls crushed in. In two confessions, Levins implicated Thomspon in the murders and on the stand repeated his statement that Thomspson had urged him on. Levins’ trial had been conducted with the public excluded, but the court room was packed when Thomspson’s case began this morning. Was said (with or without evidence) to be a drug fiend. Both had signed confessions while in police custody -- both being in a state of mental shock as well as under a great deal of duress at the time. Note that in the Rowell and Merrill family murders, due to his age, it would have been impossible for Victor to have been involved in the Murders. And as for the crimes themselves : The deaths of all three families, the Rowell’s, the Merrill’s, the Licata’s all followed the same M O. All had been murdered in their sleep, All had been struck in the head, and All had been struck at almost the same exact place. In addition to that, there were other solitary axe murders (again with the same M O) that had occurred around the Tampa Florida area during that time period. All leading to the obvious conclusion that a serial killer was involved. QUESTION: For the skeptical reader I have a question. No one (certainly not Anslinger’s narcotic police) had ever told me that the Licata family was NOT an isolated incident. That it could have been the work of a serial killer? Could there be a reason why? Knowing from my past experiences with the narcotics police (they truly are the children of the lie), great doubt’s were now entering my mind about the whole Licata Incident. Could Victor have been innocent? Could the whole thing have been one of Harry Anslinger’s great lies? It was at this point that I decided to examine all the evidence against Victor Licata. To get to the bottom of the whole thing.